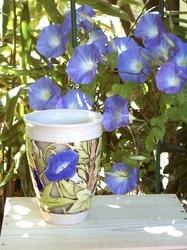 Although this site has a ton of my double wall pottery there is a lot of other items I like to create. Visit the Gallery to see examples of my work. All of my pottery is wheel thrown and hand carved. I never use molds of any kind. Everything is for sale. I use Paypal but you don't have to have a Paypal account to use it. You can use any credit card through the Paypal system. I am a member of the Coronado Art Association. Please visit the site. Please visit the Coronado Art Association.